So, there's some doubt about when and even whether there will be a court case, but what if there is? If Alinghi wins everything continues as planned, with Desafio Espanol as Challenger of Record; if not, Alinghi has to do battle, on the water, with a Russell Coutts managed BMW Oracle competing with sailing a giant multihull. Can it be that would suit Alinghi – and for that matter BMW Oracle - down to the ground? Think of the publicity such a match would engender! Russell Coutts is co-owner of the new World Sailing League multihull series and what could promote that better than an America’s Cup multi-match? Such a match would also attract huge American and European TV audiences, not to mention sail mad Ozzies and Kiwis? French journalist, Philippe Elies, reported last week that Coutts had been in Paris to meet with Van Peteghem Lauriot Prévost (VPLP) and discuss a 90ft trimaran design for a match with Alinghi. Franck Cammas was said to be at that meeting and there might be something in this rumour, since Cammas' girl friend writes a sailing column for the paper. Also, VPLP has been commissioned, by Coutts, to design the World Sailing League 70 footers! Losing in court wouldn’t matter to Alinghi; ACM could still carry on organising fleet and match racing ACTS, in the V5 boats, next year and hold a 2009 Cup, in Valencia. That is, of course, provided that an Alinghi multi can beat whatever the VPLP, Coutts, Cammas, BMW Oracle team might come up with! 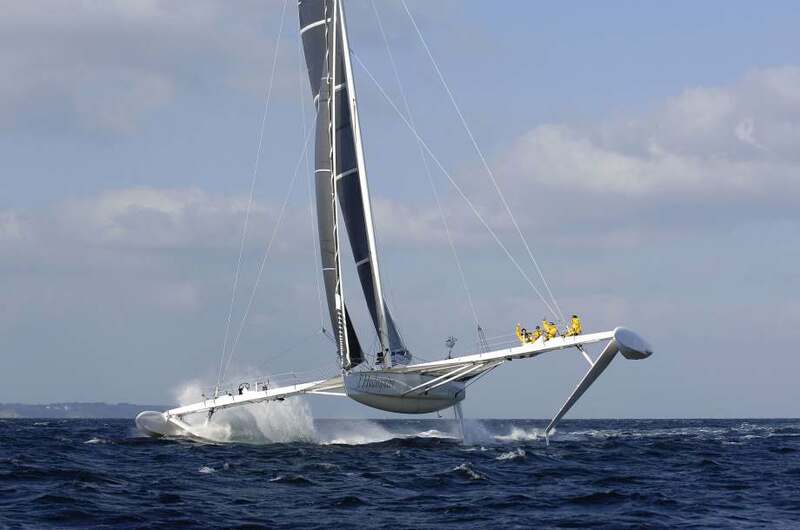 Most people have heard of the fabulous Hydroptère, the half plane half boat that flew to two World Records recently; 44,5 knots over 500 metres and 41,5 knots over one nautical mile. What is, perhaps, not so well known, are the close ties that this French rocket ship has with the Geneva sailing fraternity and SNG. On 29 May, 2006, in Lausanne, Hydroptère revealed its new plans and projects and the new partners that would be involved. Among those partners were SNG members Patrick Firmenich (President of SNG) Thierry & Adrien Lombard and Alexandre Schneiter. What’s more, the Ecole Polytechnique Fédérale de Lausanne was named as providing engineering expertise for a new generation of Hydroptères, notably computer simulation and materials optimisation, just as it does for Alinghi. The builders of this new generation of “flying boats” would be Décision SA, the builders of the Alinghi yachts! Hydroptère.ch, a 12 metre version developed to sail on Lake Geneva, is due for launching very soon. It will be used as a test bed to try out improvements for the existing Hydroptère and also for a maxi version that will be aimed at trans-ocean and round the world records. At the moment, the existing machine is about to get some new floats, made by Décision, designed by VPLP, with input from EPFL and Hydroptère’s own team of very experienced people. These floats will, everyone is sure, enable the flying machine to go over the magic 50 knot mark. 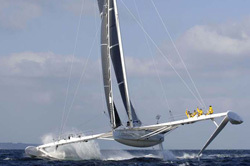 If Alinghi were to use a Hydroptère to defend the America's Cup, what could beat it? Not a conventional tri, even with the very talented Franck Cammas on the helm, and Russell Coutts must know that.